I remember as a kid enjoying a chocolate and caramel slice that Mum used to make. The caramel was made with butter condensed milk and golden syrup. 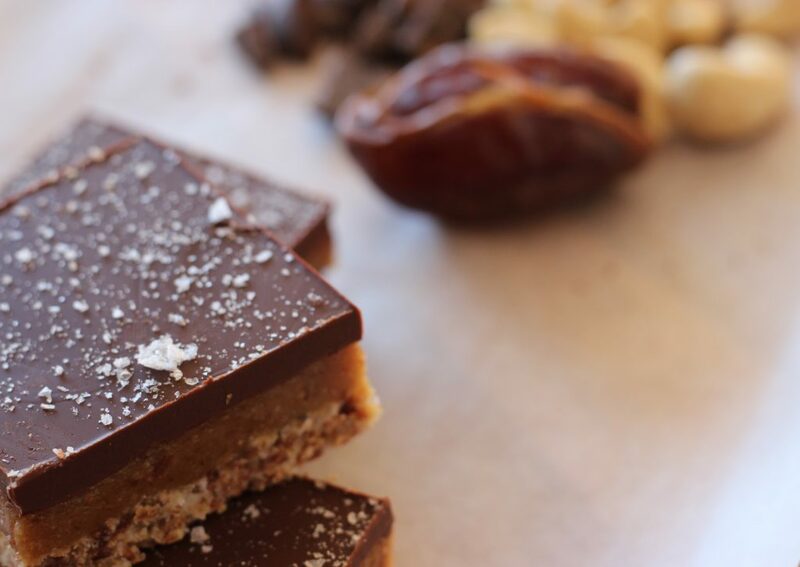 This is a healthier version of the chocolate caramel slice. Still sweet and rich so you don’t need much but less in refined sugar and more nutrient dense. This slice is Gluten and Dairy Free… enjoy a Divine moment. 12 large (or about 230g) Medjool dates, pitted. To make the slice a little less costly you good substitute with 230g of dates. 12 large (about 230g) Medjool dates, pitted. Again you could substitute with dates but having a few medjool dates will help retain that wonderful caramel taste that they give. Preheat the oven to 170C and grease and line a 20cm square cake tin. To make the base, combine the almonds, coconut, dates and salt in a food processor and pulse until fine and crumbly.Add the oil and pulse until the mixture holds together when you squeeze a lump between your fingers. Press the base evenly in to the base of the prepared tin, then bake for 12-15 minutes or until golden around the edges. Set aside to cool while you make the caramel filling. Put the dates, cashew butter, coconut oil, maple syrup and vanilla extract in a food processor and blend until the caramel is smooth and forms a large lump. Taste and add a little salt if you like. Using wet fingers, press the cashew caramel over the cooled base. Don’t worry if a milky layer appears on top of the caramel as you press down on it – this is due to the presence of coconut oil. Refrigerate for at least 3 hours or until firm. Melt the chocolate and oil in a heatproof bowl over simmering water, stirring until smooth. Spread over the chilled base and allow to set for 5 minutes. Sprinkle the slice with a little flaky sea salt, then refrigerate for 30 minutes or until the chocolate has set. Use a large sharp knife to cut the slice in to pieces. Store in an airtight container in the fridge, with baking paper in between each layer, for up to 1 week. It also stores well in the freezer if you think you will not get through it in a week.